No, it’s not a spring snowstorm drink. Although we did lose power for a few hours this afternoon, convincing me that taking a nap was exactly the way to beat the storm. With several necklaces in progress, and only one finished, I took some photos of what’s on my bench. My process is to string beads, on and off pieces of wire, until I like the combination. No matter how many times I organize the beads in front of me, I always end up with messy piles to feed my creativity. Out of sight, out of mind, you know. I like to have everything out where I can see it. I might sketch a few basic ideas, but my best results come from trial and error. I worked all winter to create and gather lots of components, so I could make a big mess finding ways to put them together. I really liked making the pod bead, below. I might pair it with the reddish glass beads from SueBeads. 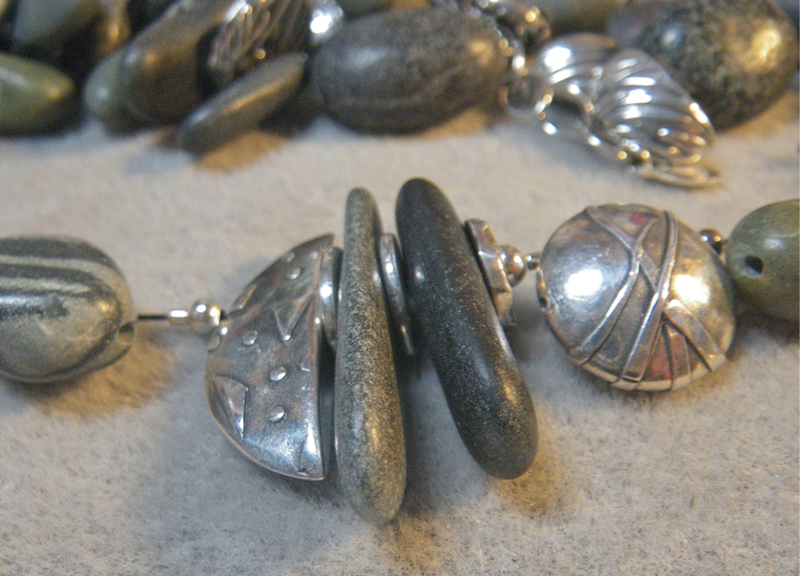 Beginning a beach rock necklace with some PMC beads. 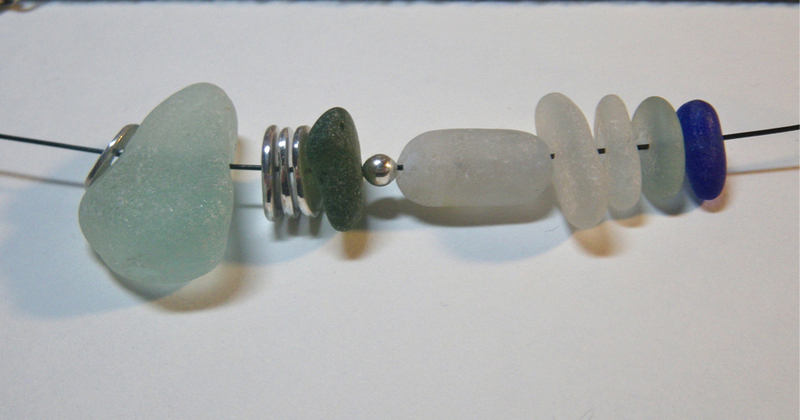 Considering ways to put sea glass together. Barbara, I’m obsessed with your blog! Love your writing, and your work is fantastic! May I ask how you obtain that beautiful soft finish on the beach stones? Wow, thanks Judy. There are days when it’s a big challenge to come up with something for the blog. But I like the discipline of posting daily, otherwise I would let things get stale. I am a great procrastinator! The beach stones are smooth and rounded like that when I pick them up on the beach. After I drill the holes, I apply a coat of Butcher’s Wax to bring out the darker colors and give them a subtle shine. The pod actually was some kind of bumpy part of a dried plant stem that I noticed on a walk last fall. I picked it, trimmed the ends and then made a silicone mold of it. The linear texture was from the bumpy thing itself. (Pod is probably not the correct term.) So, it is a bead I made form that mold. The BIG design flaw is that I can’t seem to thread beading wire through it! I’ve tried and tried, but with the curve it’s too hard to get the wire to poke through the other side. In the photo it’s actually strung on a piece of 20 gauge silver wire. Maybe I could try a beading needle…but the holes on the end are pretty small. I guess I could drill them out. I’ve had it kicking around since last fall because of the stringing issue. I love how it looks and feels. I thought it would be fun to make a whole necklace of them. But right now the cost would be prohibitive. Stay tuned! 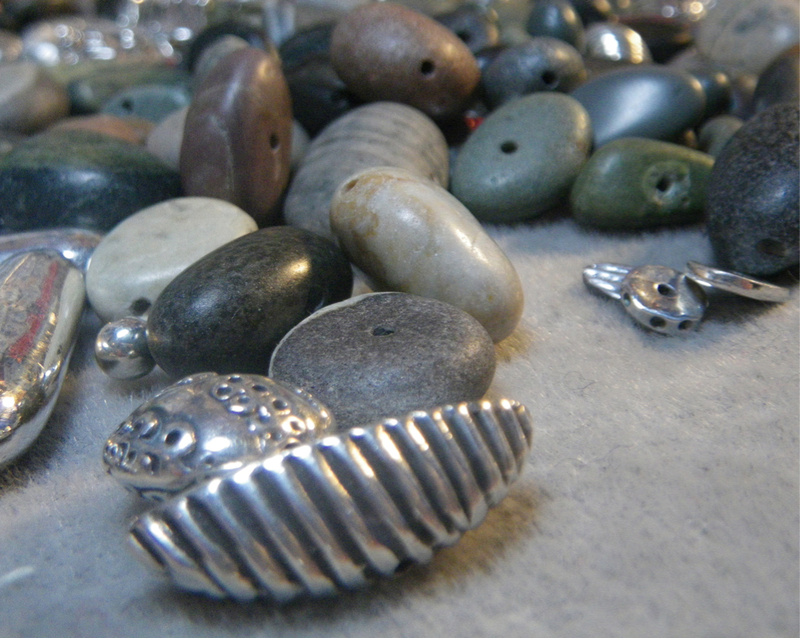 I really like your pod bead too, and the beginnings of the beach rock piece looks great! Have fun! I am having fun! It seems to take a day or two to warm up to the necklaces. I finished the beach rock piece today and it came out totally different. Photos after a day off island tomorrow.